A while back, we turned our appetites toward the Bunny Chow served up at Jiko. 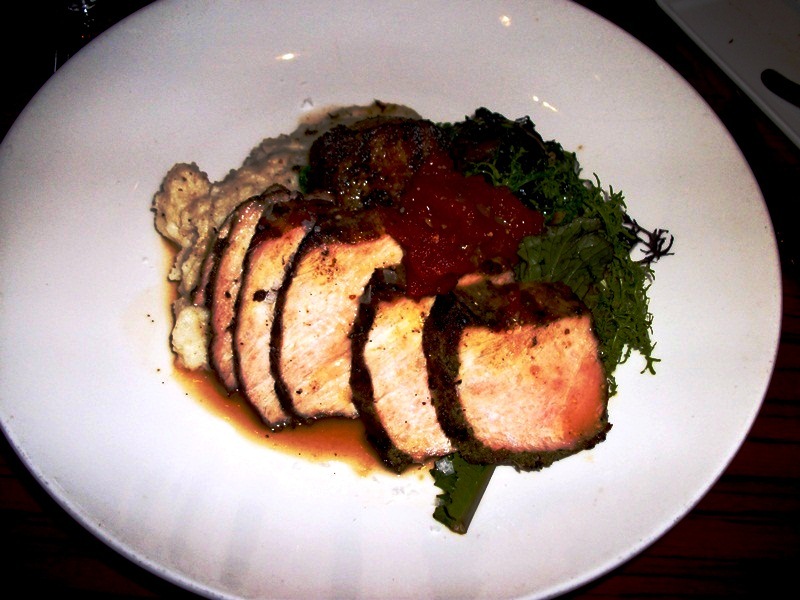 Today, we’re heading back to Jiko for something for our internal carnivores, the Grilled Berkshire Pork Loin. The menu at Jiko is known to shift regularly, based upon the freshest meats and produce that are currently available. Which means that the same version of pork reviewed here may not be available, it’s likely that there will be a comparable dish. This incarnation comes with Tanzanian “Grits,” Wilted Heirloom Mustard Greens, Tomato Preserves, and Mustard Jus. The pork, sliced on the bias, is juicy and smoky with a flavor-filled crust that melts in your mouth and made me wish the medallions were pure crust. Honestly, if they were trim off the shell of the loin and offer it up as its own dish, I would dive in head first. To offset the sharpness of the pork and mustard jus, the tomato preserves offers a sweet and tart companion, which makes for a brilliant combination. Meanwhile, the heirloom mustard greens add a bit of bitter roughage, perfect for balancing the textual offerings of the dish. Lastly, the grits offer a strong, creamy starch component that plays well with the other components of the dish. The Grilled Berkshire Pork Loin may not always be on the menu, but I would recommend it anytime that it is on the menu. No matter what dish you choose to partake in at Jiko, the kitchen team at the cooking place will not disappoint!